ferns, originally uploaded by jahansell. This is Connecticut's largest fern. Its fiddleheads are food for ruffed grouse, and hummingbirds sometimes use the fuzz on young fronds to line their nests. I had to do a google because I'd never heard of a Sensitive Fern; I thought maybe it closed up when touched or something but it turns out its because it's so sensitive to frost. A lovely photo...looks very inviting as though you could lie down and sleep on them. 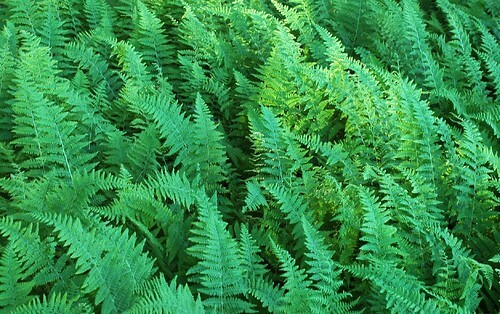 do you know that certain species of ferns are edible and really delicious. i tried them when i went holidaying in borneo. lovely! Jenny, I have a similar photo that I was going to use for my banner, alto I used an airplane instead. I think I'll post mine tomorrow as a companion post to yours. Edible says KEROPOK MAN? I may try it. If they taste as good as they look, it might be a tasty delight! Clearly they survived the frost. A great shade of green. (I'm into a blue period chez moi). but want to get deep into the ferny woods and really take a lot of snaps. they are such peaceful and fragile looking plants. I ate some ferns, sauteed, last month. my human companion brought them from some market. Amazing sea of ferns. I didn't know they grow this far north.